It would have been better if I had a hot plate to serve this dish in, especially now that winter is almost here, food tends to get cold pretty quickly. Come to think about it, I should have at least heated up the plate I planned to serve it in, so that at least it helps the food to retain some heat. Then I would have more reason to call this "Hot Plate Tofu". Next time perhaps. I love tofu of all sorts (except for the stinky ones), and egg (or Japanese) tofu is one of my favourites. Silky smooth and custard-like, it has more flavour compared to regular white beancurd. I still don't understand why some people find eating tofu revolting, unless it's been disguised as a Vegan [Tofu] Cheesecake, which in my opinion sounds more bizarre than plain tofu itself. Anyway, I cooked this dish for last night's dinner and it was simple and quick to prepare, with just 2 core ingredients, tofu and minced pork (I had initially wanted to use prawns instead, but they didn't have small prawns at the market). 1) Marinate 200g minced pork with soy, pepper, sugar, sesame oil and cornflour along with 1 tbsp water. 2) Cut tofu (2 tubes) into 1.5cm slices and deep-fry till golden in colour. You can dust them in tapioca starch/cornflour before frying if you like. Drain on absorbent paper. 3) In a wok, fry some garlic, add some sliced shitake/chinese black mushrooms and the pork until cooked. You can also add some carrots, peas, sweet corn kernels etc. Add 1 tbsp oyster sauce, a little light soy, some dark soy (for colour), shaoxing wine, dash of chicken stock powder, sugar and pepper with 1/2 cup water and bring to boil. Thicken with a little cornstarch/tapioca starch solution, making sure there is sufficient gravy. Add a few drops of sesame oil. Dish out into a bowl. 4) Lightly beat 2 eggs with 1 tbsp water, season with soy and pepper. Fry in a wok/pan on high heat to make a large round omelette. 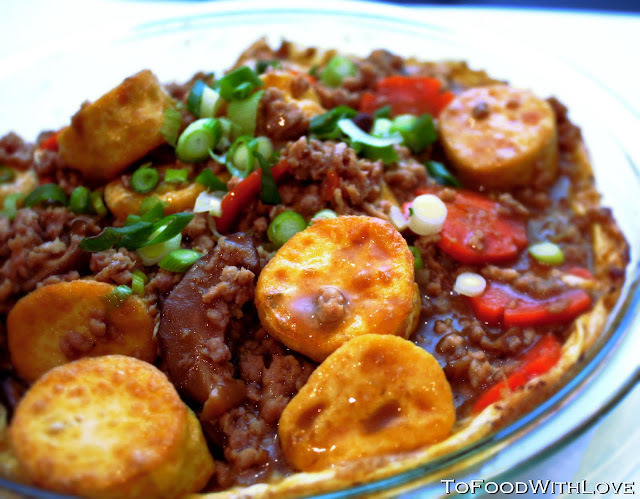 When the egg is almost set, add the tofu and minced pork over the centre of the egg, let it cook for a minute (so that you get nice crisp edges and bottom for the omelette), then carefully slide the omelette, tofu and all onto a plate. Of course, if you have a hot plate, then just pour the beaten eggs onto the plate and let it sizzle before topping with the tofu and pork. Garnish with spring onions and sliced red chillies if desired. Serve hot with steamed jasmine rice. I found your blog as I'm seaching the recipe of mince pork tofu. I’ve always like the Japanese Egg Tofu as compared to the normal ones and this is one of the best way to serve it or cook it on sizzling iron dish.I love the consistency of the gravy too.